Markings: The left side of the barrel is marked “41 COLT. The left side of the frame is marked “PAT SEPT.19.1871. / JULY 2,72. JAN.19,75.” and with a Rampant Colt logo. The top of the barrel is marked “COLT’S PT. F.A. MFG. Co. HARTFORD, CT. U.S.A.”. The underside of the frame at the trigger guard and the trigger guard are marked “270061”. The bottom of the backstrap is marked with “270 / 061”. The top rear of the loading gate is marked with an assembly number “6667”. The left front of the trigger guard is marked with a “VP” in a triangle and the rear with “5”. The back of the frame under the hammer and above the cylinder pin hole is marked “7”. Sights / Optics: This revolver is mounted with a “V” groove in the top strap for a rear sight and a thin, almost rectangular shaped, front sight blade fixed to the barrel. Stock Configuration & Condition: The grips are checkered black hard rubber with Rampant Colts in an oval at the tops of the grips. There are a few tiny dings and scuff marks in the bottoms of the grips and a few dings in the rear borders of the grips, with a thin sliver missing from the bottom inside edge of the right grip. The checkered surfaces show heavy wear with a bruise in the left grip, a drag line in the right grip and light scratches from handling in both grips. The grips are in about Good to Very Good overall condition. Type of Finish: The finish is blued with a case colored frame. Bore Condition: The bore is gray with moderate wear in the rifling. There is light erosion scattered throughout the bore with a few spots of moderate erosion near the muzzle. Overall Condition: This revolver retains about 13% of its metal finish. There is some thinned finish remaining in the sides of the backstrap and front strap, the cylinder flutes and the protected areas of the barrel, with case coloring still visible in the sides of the frame in front of the cylinder. The remainder shows finish loss with scattered spots of pinprick surface erosion in the barrel, ejector rod housing and the bottom of the backstrap, and spots of surface frosting scattered over the cylinder and frame. There are multiple small dings around the front sight blade and in the underside rear of the barrel, a few tiny dings in the right side of the frame and tool marks around the screw heads in the left side of the frame. The cylinder shows a fairly deep drag line and the hammer knurling shows light wear. The grip screw and the backstrap and front strap screws are disfigured. The markings on clear and those on the left side of the frame are crisp. The revolver is in about Good to Very Good condition. Our Assessment: The Colt SAA revolver and Winchester Model 1873 rifle were two guns that helped tame the Wild West of the United States in the last quarter of the 19th Century. This is a nearly one hundred and fourteen-year-old Colt SAA 1st Generation revolver made in the Early Smokeless Powder period with a blued finish and a case colored frame. The revolver has a 7 ½” barrel, black checkered hard rubber grips, and is chambered in .41 Long Colt. The .41 Long Colt was originally made for use in the M1877 Thunderer double action revolver. Although less potent than its better-known cousin, the .45 Colt, Elmer Keith in “Sixguns” wrote that it was a better fight stopper than its paper ballistics would indicate. 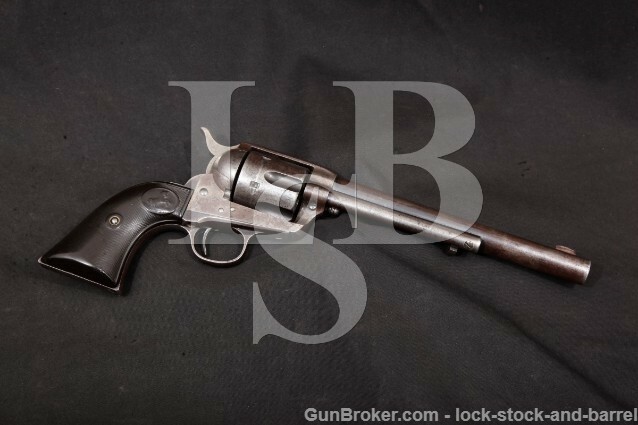 The revolver is in about Good to Very Good condition with about 13% of its original finish remaining. The bore is gray with moderate wear in the rifling and light to moderate erosion in the bore. All of the Colt 1st Generation revolvers are heavily collected, and we expect this one to be as well, but its front sight modification might dampen the enthusiasm of the serious collectors, giving the beginning collectors a better chance of acquiring a nice piece of history.